Libraries are more important to our communities than ever before. But people don't always understand that. This completely revised version of Ask Without Fear! is written exclusively for librarians and library board members. It gives you a strategy for raising major gifts in a framework that will work with fundraising letters, grants, and corporate sponsorships. Because it's written for, and reviewed by librarians, you'll get the exact phrases to use in fundraising for your library. You'll even get ways to overcome objections before they come up! This book will help jumpstart your library's fundraising! "Using Marc's framework, we were able to exceed our fundraising goal in the worst recession since the Great Depression." 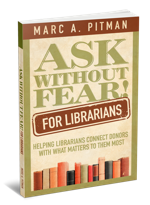 "'Ask Without Fear for Librarians' is an excellent confidence builder. I'm eager to see libraries around the country put its strategy into practice." Download the e-book–the full text of the print version– and start learning today! Have a Kindle? Download Ask Without Fear! formatted for Amazon's Kindle! Have a Nook, Kobo, or Sony eReader? Get Ask Without Fear! in the special ePub format!